Liverpool boss Rafa Benitez has accepted an apology from his players for their antics in their Portuguese training camp. 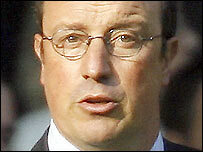 And Benitez says his side are "ready to go" against Barcelona in the Nou Camp. Reports alleged a fracas occurred between Craig Bellamy and John Arne Riise during preparations for the tie. Benitiz said: "They have apologised and said they will accept everything. Of course, we must do something about it and the players know they'll be fined." The Liverpool boss added: "The reaction from the players was good, they made a mistake and they are ready." Benitez played down the training camp incident in Portugal and said: "The problem is not as big as reported in the press, so there really haven't been many players fined. "They apologised and the atmosphere is good. We are ready for the match." He added: "It was a shame it had to happen, but it doesn't matter now. "It is over, as I have said. The players' reaction was great and we have put it behind us and are concentrating on the game." And the Spaniard insists his team selection for the first knock-out round, first-leg encounter will not be affected by events in Portugal. "The players are all here and if they are here, I can use all of them," he said. "Those kind of things don't make any difference on the pitch."